Winston Peters is reviving his old anti-Asian bogeyman. This time he’s blaming elderly Asian migrants “cashing” in on New Zealand’s superannuation scheme. Peters’ racist tactics are groundless and he cannot provide a shred of evidence to support his claims. The truth is, far from “cashing” in on New Zealand, relatively youthful Asian immigrants make a massive contribution to New Zealand’s economy in taxes when they enter the country and when they buy the necessary items to start a new life in a new country. They need housing, clothing, food, education and work. All of this is something that the National Party knows and is keen for so long as migrants continue to contribute to the bottom dollar. So there is a contradiction in ruling class attitudes to anti-Asian racism at the moment. It is a tried and true tactic of ‘divide and rule’, but big sections of the ruling class also recognize the need for immigration, and for trade with Asia. There is no denying, though, that Peters’ scare-mongering can sometimes connect beyond the ranks of permanent Asian-haters. Just look at the response his comments on Asian street signs got. Like any bogeyman, however, ordinary people’s fear of Asians “cashing in” on New Zealand’s superannuation rests on people’s actual lived experiences – a reality of despair about rising food prices, low wages, and increasing living costs. In the wake of National’s “zero surplus budget”, our living standards are being ground down even more, especially beneficiaries, solo mothers, and students. Blaming Asians for the social inequalities in society takes the heat off politicians and bosses – people who have real power in society. It’s not Asians who keep the minimum wage at a paltry $13.50, or who lock out an entire work force for daring to exercising their democratic right to bargain collectively, like the Affco-Talleys workers found. Racism can seriously weaken our side. In a multicultural society like New Zealand, anything that undermines our sense of collectivity works to weaken our unions and our campaigns. Divide and rule can work on a simple level – a supermarket might organize shifts so different ethnicities work different times – or it can involve more systematic injustices. One look at New Zealand’s fishing industry is a case in point. Seafood is one of New Zealand’s largest export markets raising $3 billion annually. The 2010 sinking of the Korean-owned vessel Oyang 70 revealed the super exploitative, inhumane, slave-like conditions foreign workers onboard were subjected to. This was just the tip of the iceberg. The 2011 government inquiry into the industry found widespread instances of workers having passports confiscated, subjected to physical violence and abuse, and forced to work seven days a week. Maritime Union of New Zealand General Secretary Joe Fleetwood said racism was rife in the fishing industry and the foreigners employed in the industry were treated “like rubbish”. The 2011 Trafficking in Persons Report found that foreign workers were being charged “excessive and escalating recruitment fees, experience unjustified salary deductions, restrictions on their movement, confiscation of passports, and altered contracts or working conditions without their permission”. The Service and Food Worker’s Union and MUNZ deserve full credit for highlighting and opposing the super exploitation of overseas workers. But their alternative to combat racism in the industry is to argue for vessels that are “New Zealand-registered and crewed by New Zealanders.” This does nothing to address the precarious situation of those foreign workers. If bosses are prepared to exploit cheap Asian labourers, those workers should get full rights like any worker living in New Zealand. Moreover, we need to demand not “protection” from overseas workers, but that New Zealand business and governments expand employment. More taxes on the fishing industry, more investment by government, more training and more jobs. The greatest enemy of New Zealand workers is the New Zealand capitalist class. It was Port of Auckland in cahoots with Auckland Council that tried to smash MUNZ just this year. Union solidarity, in contrast, was global, coming from Australia, the US and Japan. Although Chinese settlement of New Zealand dates back as far as white settlement, New Zealand has an abysmal history of racism towards Chinese. 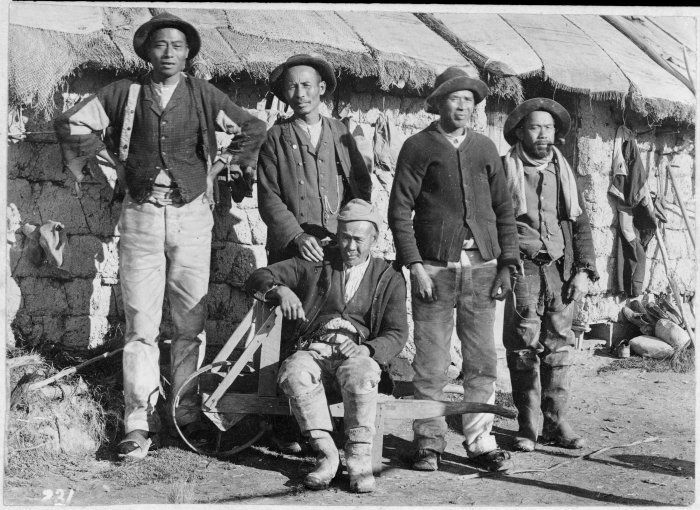 The first group of Chinese was actually invited here to work in the goldfields in 1866 by the Dunedin Chamber of Commerce as they were seen as more hard working and law-abiding than white immigrants. Subsequently, due to the anti-Chinese hysteria that was whipped up, Chinese immigrants were forced to pay a poll tax to enter the country. The so-called left also had its share anti-Chinese sentiment too from these times too. Prominent socialist and editor of the labour publication Maoriland Worker Ettie Rout was a firm eugenicist who believed that the “yellow race” were inferior to whites and Maori. WWII also brought out the worst form of racism against Japanese – often portraying Japanese as sub human barbarians who were crazed enough to continue fighting unless an atomic bomb stopped them. Fast-forward to today and while discrimination based on ethnicity is illegal, Asians still remain one of the most discriminated groups according to a 2011 survey commissioned by the Human Rights Commission. Asians growing up in New Zealand have to face racially motivated verbal and physical abuse everyday, and face employment barriers because of their non-English names. Most people on the left quite rightly reject Winston Peter’s crude and open racism, but the nationalistic logic behind his party’s name, New Zealand First, has much wider political resonance. The populist rhetoric of nationalism is the other side of the same coin of racism. Whatever people may want to believe, you can’t have nationalism without racism because it has to inculcate the “us over them” mentality and obscure the real class antagonisms that divides New Zealand. This type of nationalism infects the left too as evident with MUNZ’s demand for New Zealand-registered and crewed vessels. New Zealand does look different to how it did 30 years ago. Between 1991 and 2001, the proportion of Asians in New Zealand almost doubled. In the 2006 census this number increased further to 9.6% of the population. National and ACT have been making obvious efforts to woo Asian voters. And it’s true that many Asians come from countries where there are not strong union traditions. So our side needs to fight for these workers – see migrants as an opportunity to organize, and not as a threat.